Set in early 1970s London, TTSS follows retired intelligence officer George Smiley (Gary Oldman, Red Riding Hood) as he’s reactivated by a government minister (Simon McBurney, Jane Eyre) to hunt down a Soviet mole who’s working in the high ranks of the British intelligence community. Methodically “spying on spies”–former colleagues portrayed by Colin Firth (The King’s Speech), Ciaran Hinds (The Debt), Toby Jones (Your Highness) and David Dencik (The Girl with the Dragon Tattoo)–Smiley slowly unravels a deep, complicated mystery involving friends, operatives and events old and new. 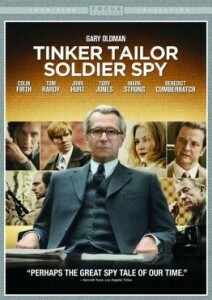 Gary Oldman is George Smiley in Tinker Tailor Soldier Spy. TTSS is a spy story that plays on the “simmer” setting. Most of its leading players are middle-aged men and women (and older!) whose “spy” careers consist of decoding ciphers, relaying secret communiqués and filing reports. And that’s how the quiet, careful-to-consider-everything Smiley does his job. 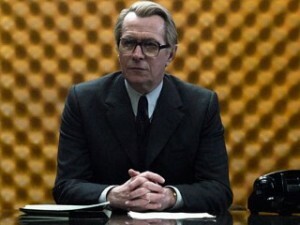 Oldman’s performance is a study in pensive restraint as he brings to life a weary intelligence veteran who doesn’t have strong feeling for anything in his personal life (at least, not anymore), just as his professional life—the glorious “old days’ of British intelligence—has recently vanished. His yearning to do something good, something right, is always right beneath the surface of his subdued face. The camerawork, meanwhile, is fluid and sharp but, like the production design, doesn’t draw attention to itself. Even the flashback sequences and a few scenes of violence are handled with reason and restraint. It’s low-key presence is its strength, all the better to support the players and their story, an elaborate one that one must pay close attention to if one wants to know what the hell is going on. TTSS is not for all tastes in this age of Jason Bourne flash drives. But for fans of Le Carre and long, juicy spy yarns about spies that conduct their spying from the office, it’s the perfect cup of tea. The standout features among the Blu-ray’s supplemental materials—which include cast and crew interviews, a First Look featurette and six minutes of deleted scenes—are the commentary track by director Alfredson and actor Oldman and a half-hour interview with John le Carre. The novelist is enthusiastic about this most recent adaptation of his book, pointing out that “it is not the film of the book, it is the film of the film.” He also notes that the movie, like his writing, is not about being authentic as much as it’s about being plausible.